The KL3162 analog input terminal processes signals in the range of 0 to +10 V. The voltage is digitised to a resolution of 16 bits and is transmitted, electrically isolated, to the higher-level automation device. 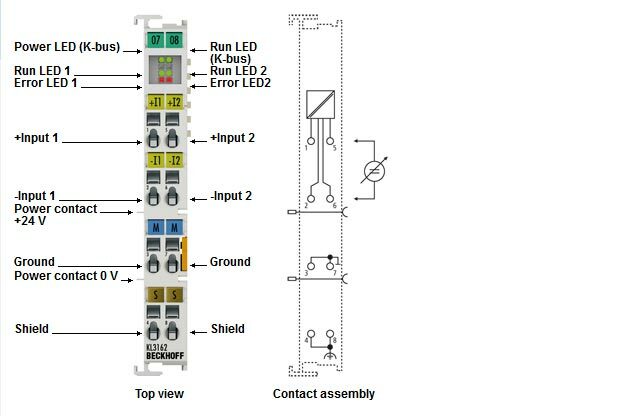 The input channels of the Bus Terminal have differential inputs and a common, internal ground potential. With the high measurement accuracy of ±0.05 % (relative to full scale value), the terminal is optimised for high-precision control processes, such as dosing, filling, or quality assurance. The Bus Terminal has two channels within a housing. LEDs indicate data exchange with the Bus Coupler.